One of the most important documents in a divorce is your financial statement. It impacts how community property is divided between the parties, the amount of spousal maintenance (if any), and child support. Filling out a detailed financial statement is about as enjoyable as a trip to the dentist. But it is absolutely necessary and it can be a huge help in developing a strategy in your divorce and deciding what you need for life after divorce. List each and every one of your monthly expenses. Do not leave anything out, even that $10 monthly fee for Netflix. Make sure the listed expenses are precise so the court has confidence that the numbers are accurate. Being precise and detailed is key because there have been instances where a financial statement was thrown together last minute containing inaccurate information or inflated expenses and signed by the party completing it. You can use the inaccurate financial statement submitted by your soon-to-be-ex-spouse to impeach their credibility and enhance your standing with the court. One of the first steps is to get copies of all of your credit reports from the three major credit bureaus. These reports can be helpful when figuring out the balance owed on your mortgage and other items such as vehicles. Make sure you obtain credit reports for all of your accounts, whether they be joint accounts or individual accounts. Next, you should obtain your income tax returns for the last three years. If your spouse did the taxes, you can obtain copies directly from the IRS. 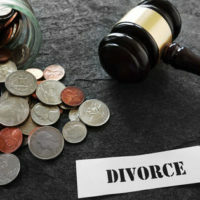 This information will be helpful in establishing the income you earned over a specific period so the court can assess whether you qualify for spousal support. During this process, make sure you track all of your expenses. There are free apps available today that help you in this endeavor that literally detail, on a day-to-day basis, what you spend. You may be feeling overwhelmed by the prospect of collecting exact figures for your monthly income, your monthly liabilities, and other financial information. We are here to help and are more than happy to guide you through the process. The divorce lawyers in Houston of Lindamood & Robinson, P.C. have decades of experience helping people through the difficult and complex aspects of a divorce. Contact our office today to schedule a confidential consultation to discuss your case. Our law firm provides divorce representation in multiple cities and counties across Texas including Galveston County, Harris County, and Houston County.